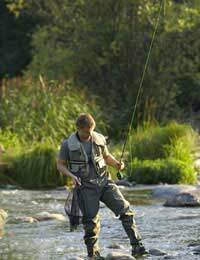 All across the United Kingdom there are wonderful places in which to fish for your favourite type of fish and also your favourite kind of fishing. Whether it is coarse fishing, fly fishing, game fishing, sea fishing or simply sitting by a river's edge, there is something for everyone. Here we look at some of the best places in the United Kingdom to go fishing. Barbel fish are quite common in most rivers but favour oxygenated waters best. With this in mind the River Dove and the River Trent are two of the best places - river wise - in which to catch Barbel. With idyllic views and long stretches of unfished water, these two rivers bode well for the fisherman who wants to try his hand at catching a Barbel which can vary in size from one to three and a half kilograms. Carp can be found in still waters and rivers and there are many such places like this across the United Kingdom. Most regions have their own reservoir which can be stocked by local fisheries in order to provide game fishing and you can find these by searching the Internet. When fishing at such locations it is required that you pay for a day's fishing but must return the fish to the water afterwards. Northumbria is one of the best places in the United Kingdom to go trout fishing. There are many fishing lakes and reservoirs stocked full of wild brown trout, rainbow trout and blue trout. Again a licence is required and you can purchase a day's fishing licence if you so choose. There are many different locations throughout the British Isles where sea fishing is at a premium none more so than Dover. There are three piers where sea fishing is at a premium - Prince of Wales Pier, Admiralty Pier and the Southern Breakwater. You must pay a fee to use these piers however and for more information why not visit the Dover Sea Angling Association's website. There is also excellent sea fishing to be had in the Bristol Channel area, around the area of Minehead Harbour. You can if you wish hire a private charter to take you out to sea. For those who like to fly fish some of the best fly fishing locations to be found at in Cumbria. Rivers such as the Eden in the Eden Valley district are prime spots for such fishing and here you can fish for salmon, brown trout and grayling. There are fish to be sought after in the river Eden all year round. These are just a few of the locations in the United Kingdom where you can come to fish and to relax and enjoy some of the finest and most beautiful landscapes. For more information contact your local Tourist Information Centre to enquire about these beautiful fishing spots or you can search for angling clubs up and down the country who offer not only day fishing but annual subscriptions and excursions as well as courses in how to get the most out of your fishing.